They can be fairly hard to spot if you’re zipping through the landscape at 8 mph on a golf cart, but it is also hard to ignore 50 feet of a defoliating hibiscus hedge as a result of the collective appetite of an io caterpillar infestation. 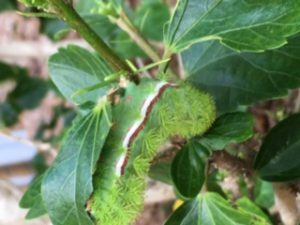 The huge population of io caterpillars on a previously thriving hibiscus hedge, was the surprising discovery of a few landscapers in late summer. 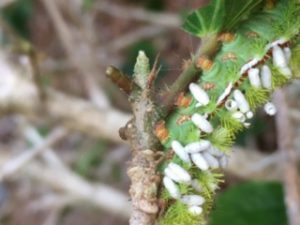 On closer inspection, we had an even more interesting discovery: all the io caterpillars were covered in egg sacs from a parasitic wasp! Nature was already taking care of the problem. Because in the insect world there actually is such a thing as “good bug vs. bad bug,” it is especially important to identify what type of insects are present in your landscape before acting on the urge to break out your pest-buster gear. Many avid butterfly gardeners do have to tolerate caterpillar-infested plants if they want to be rewarded with butterflies. 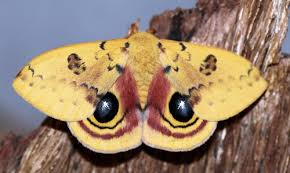 However, it is also important to note that appearances can be deceiving; these cute-and-fuzzy io caterpillars are venomous and should not be touched without gloves. Be careful about applying insecticides which will eliminate natural pest enemies (beneficial insects) as well as the problem insects. This can result in suppression of the beneficial insect population which makes relying on chemical pest control not just the last resort, but the only resort.